I have a illness. It’s invisible to other people’s eyes. It’s called Endometriosis and it it’s pretty common, at least 10% of women have it. Still, most people have never even heard about this disease, it takes nearly a decade to be diagnosed, and it’s a debilitating condition which causes pain sometime worse than labor, organ adhesion, bowel/bladder issues, infertility, and so on, without even starting to talk about the emotional toll that all of it carries. No one still can tell for sure what causes it, there is not a definitive cure, the most effective surgery is sadly not the most practiced, hormonal cures don’t stop it and have horrible side effects, and the natural route (which can only manage the symptoms) is so vaste, and equally expensive and overwhelming that still have an impact on the quality of life, as a person spend all the free time (and money) between cooking organic food at home, taking supplements, yoga, massage, acupuncture, reiki, naturopath, chiropractor, psicotherapist, nutritionist, and so on, while doing monitoring exams, seeing various specialists, surgeries etc . Oh I forgot, all of this while you’re already feeling exhausted. Canada cover the expenses of surgery, but not all country do, and women need to have several surgeries in their life time, even fly far from home to (hope to) have the adequate care. To not mention disability, or days lost from work due to it. Research is poorly founded, despite the incredible number of people affected by it (at least 176 million world wide). I was silent for a while, ashamed (who likes to talk about sick ovaries and bowel issues to other people raise his hand! ), feeling in fault because I couldn’t handle my life as I once was able too, or because I was somehow affecting the life of those around me, not filling their expectation or the ones I have for myself. Silence brought me nowhere. I tried to explain it, but again, it is an invisible and unknown illness, even when I tried they couldn’t really understand. “Is it a benign tumor?”. Me:(sigh)”…yes…” (benign… seems pretty evil to me, it’s a systemic disease that involves both the immune and endocrine systems and even after surgery it keeps coming back with revenge…but, hey! At least you understand the word tumor!). Then, talking with other women with endo, I finally learnt that all I was experiencing were symptoms of this nasty illness. That it wasn’t my fault. It somehow helped me to feel confident and speak up about it. To not feel anymore ashamed and to understand that the basic problem about this illness is IGNORANCE, even in the the medical community, imagine the average person. What I’d really want is for the whole world to know the name “Endometriosis”, or at least “Endo” for short, and to recognize it, to help women like me to be diagnosed sooner, and to find a definitive cure, because this illness is really taking the best out of me and of all these women who suffers from it. I saw how this 3D printing community is great and it can touch every side of the globe. A few years ago, I put a model of a Treefrog online, to learn about 3D printing, and now it is a benchmark for this industry. Over 50.000 downloads and many more printed. If I could find the same support I got for my art and technical knowledge to help me spreading the word and support about Endometriosis, we’d all be helping making the life of these 176 million women better. Livable, enjoying life as they knew it before this thing took over them, and be able to care for their loved ones. 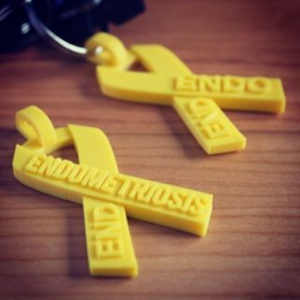 I posted the END ENDOMETRIOSIS AWARENESS RIBBON on various 3d printing websites: Thingiverse, Pinshape and Tinkercad (where you can even personalize it with your own Endo message). Please, Print it in yellow and Spread awareness. Wear it on for your wife, girlfriend, daughter, best friend, colleagues and yourself. Sell it, but only to raise money for Endometriosis organizations of your choice, to help research, education and support. Help me to have a brighter future and to just worry about doing more beautiful art, instead of spending all my time devoured by this disease.